Ever since I realised that you don’t need to make them in advance, I’ve been getting more and more into flavoured butters. I mean it’s butter with extra flavours. And it only takes a few minutes to make the most amazing sauce. The only trick here is you need to have your butter at room temperature before starting. However, you can always give it a zap in the microwave if you forget. Apart from the middle of Summer I keep some butter in the pantry so it’s always ready to go. I’ve used shiro or white miso here. It has the mildest flavour of the miso pastes. If using a darker miso, start with less and add to taste. And if you don’t have any miso you should get some (see here for other miso ideas) or see the variations below for a miso-free option. 1. Place butter in a small bowl with the miso and lime juice. Smash with a fork to mix thoroughly. Taste and season with more miso if needed (but you probably won’t!). 2. Heat a frying pan or BBQ on a medium high heat. Rub fish with oil and sprinkle with a little salt, remembering the miso butter is pretty salty. Sear fish for 3-5 minutes on each side or until cooked to your liking. 3. Divide spinach / salad between two plates. 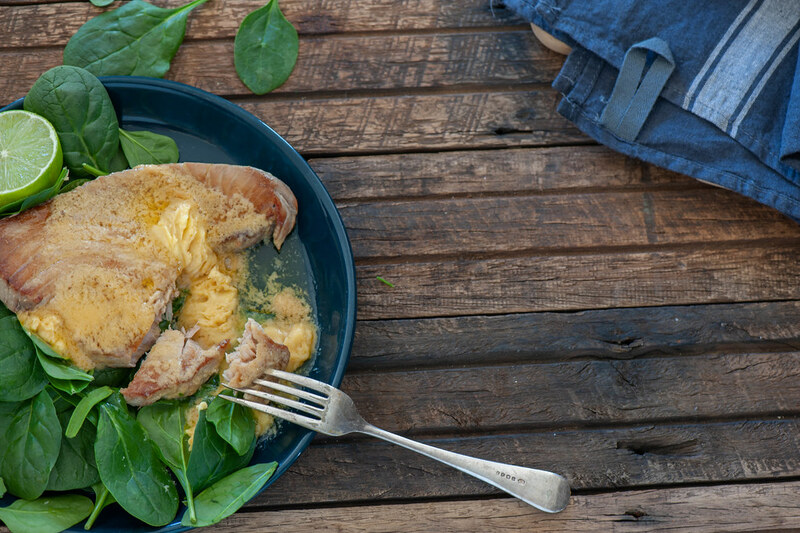 Top with fish and smear the butter over your fish so that it melts to form an incredible sauce. WINE MATCH: A cold Asahi beer or crisp dry white like riesling or pinot gris. short on time – make the butter while the fish is cooking. no miso paste – just make a lime butter using salt and butter and the zest of 1 lime. vegetarian – serve the lime & miso butter on grilled veg (like eggplant, zucchini and capsicum). Or stir the butter through cooked lentils (yum!). Flavoured butters are great with fried eggs and wilted greens too. So many options! dairy-free – make a lime and miso oil by replacing butter with 3-4 tablespoons extra virgin olive oil. more substantial (carb lovers) – serve with steamed rice or cooked noodles. more substantial (low carb) – serve with more low carb veg, extra butter (yes!) or roast seeds or nuts. (Sunflower seeds are lovely) or sesame seeds for keeping it more Japanese in vibe. 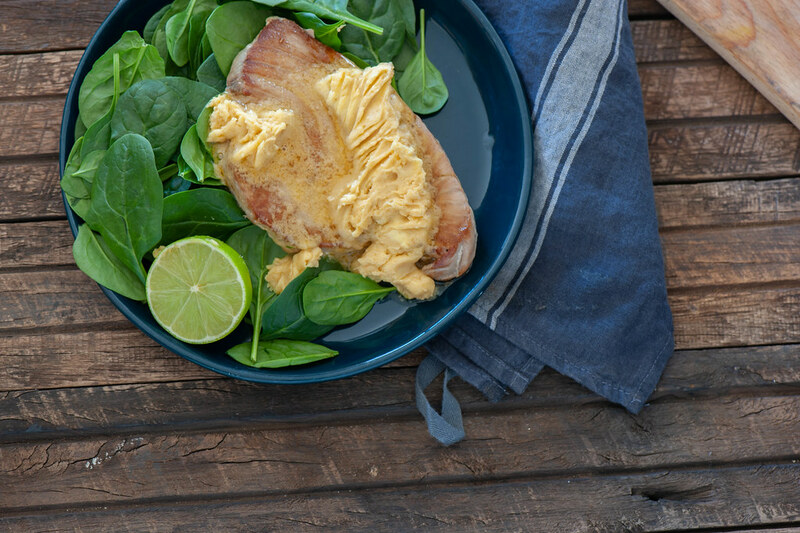 different protein – the miso butter is fab with chicken as well. no lime – lemon juice will work too. butter – will keep in the fridge for weeks. miso paste – unopened paste can be kept in the pantry, once open needs to be refrigerated. lime – whole limes will keep in a plastic bag in the fridge for months. tuna steaks or other fish – freeze them. baby spinach or salad leaves – are highly perishable. My first path would be to use them for another meal (salad for breakfast!) but if that isn’t possible you can pop them in the freezer. They will wilt down but can then be used anywhere you’d use wilted greens. At least this way they won’t go slimy. You can make the butter ahead and keep in the fridge. Just remember to get it out a few hours before serving so it will be nice and soft. I prefer to cook the fish as needed! Leftovers will keep in the fridge for 1-2 weeks or can be frozen. Either serve cold from the fridge or warm in a pan with a little oil.